Synthetic weed products "are not safe and may affect the brain much more powerfully than marijuana," officials say. The contaminated synthetic marijuana that Illinois public health officials have been warning about has claimed at least two lives — a 22-year-old suburban Chicago man and another state resident. The Chicago man, who died on March 28 after smoking synthetic pot, was found to have in his system traces of the anticoagulant brodifacoum — which is a chemical used in rat poison — the Cook County Medical Examiner’s Office reported Friday. The agency did not release his name. The other fatality was reported by the Illinois Department of Public Heath, which did not identify that person either. The reported death comes less than a week after Illinois officials reported an outbreak of 89 cases since March 7 of severe bleeding linked to contaminated drugs. Thirty of those cases were in what's called Chicagoland, meaning the city and suburbs. 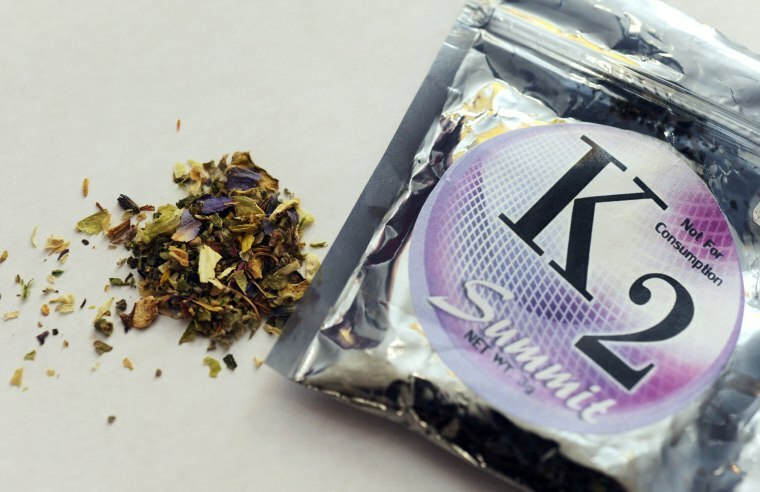 Sold as K2 or "Spice," synthetic cannabinoids are chemicals that are “sprayed on dried, shredded plant material so they can be smoked or sold as liquids to be vaporized and inhaled in e-cigarettes and other devices,” according to the National Institute on Drug Abuse (NIDA). The chemicals act on brain cell receptors like marijuana and are often marketed as safe and legal alternatives to pot.